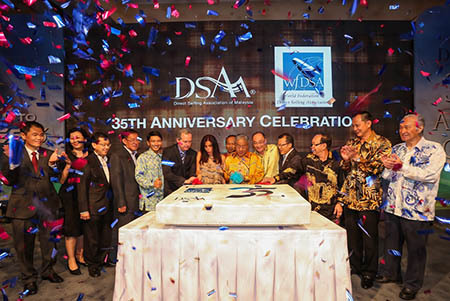 The World Federation of Direct Selling Associations (WFDSA) and the Direct Selling Association of Malaysia (DSAM) celebrated their 35thAnniversaries at a Gala Dinner on 18thSeptember 2013 at Mandarin Oriental Hotel Kuala Lumpur. The Chairman of WFDSA Mr Alessandro Carlucci, joined DSAM’s President Mr Frederick Ng and the DSAM Board in this auspicious occasion. The highlight of the night was the Anniversary Cake Cutting Ceremony. Guest of Honour for the night, YB Dato’ Hasan Malek, Minister of Domestic Trade, Co-Operatives and Consumerism graced the event and joined in the festivities.